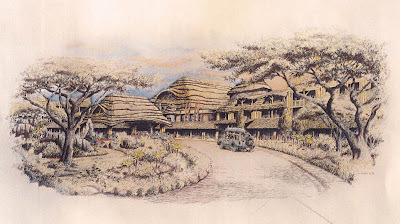 Here is the awaited part two of the Disney's Animal Kingdom original artwork article , and if you've missed the part one you can find it HERE. 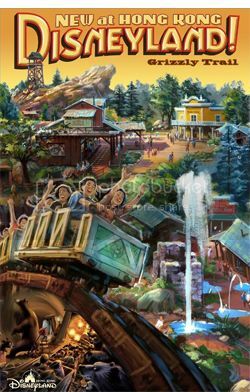 Above, a great artwork showing different elements of the park! 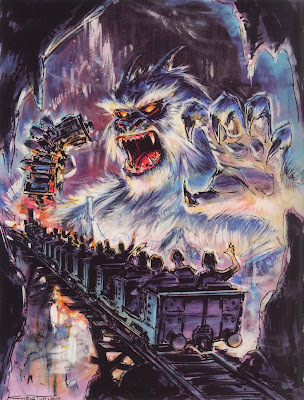 We're back in Asia and we begin by Expedition Everest artwork! Below, a beautiful Dan Goozee concept-art. 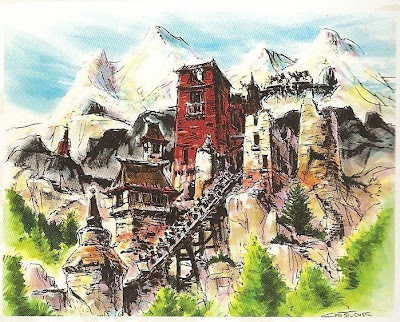 Next, another early concept by Chris Turner showing the Tibetan temple where the train goes through on the first lift. 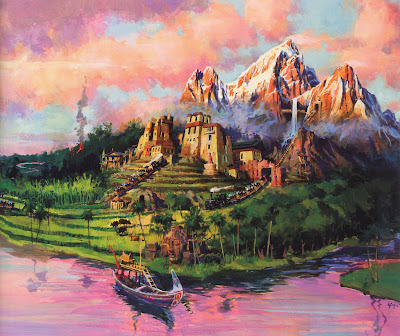 The most famous of all Expedition Everest artwork, as it was the one chosen when the announcement was officially released. Below, a Ray Spencer rendering showing the village of Serka Zong. 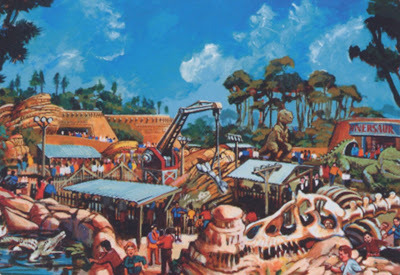 A rare rendering showing the beginning of the Expedition Everest ride. 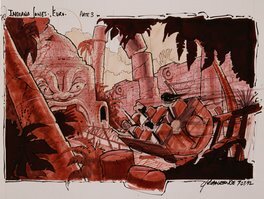 This next one, an early concept by Chris Turner shows a never-realised scene, and all i can say is that i regret it as it looks really great! 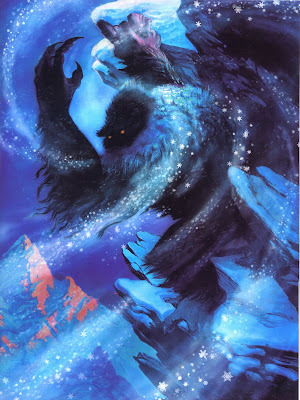 Below, a beautiful painting by Joe Rhode of the yeti. This Chris Turner concept shows a giant yeti. 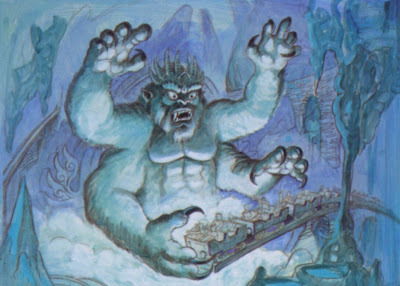 There is still a first encounter with the yeti and projection effect, but the size is smaller. 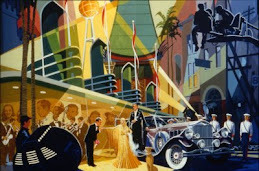 There is one more early concept for this ride scene with this Joe Rhode painting. 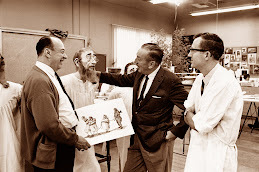 Just like in the part one, you will also find some pictures of the imagineers at work. 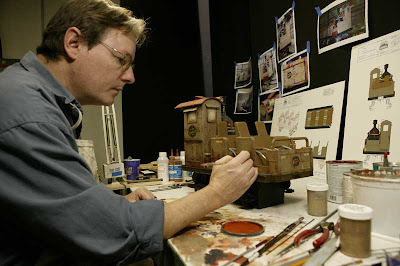 Here a WDI imagineer is working on the tea train locomotive model. A close shot on the locomotive itself. 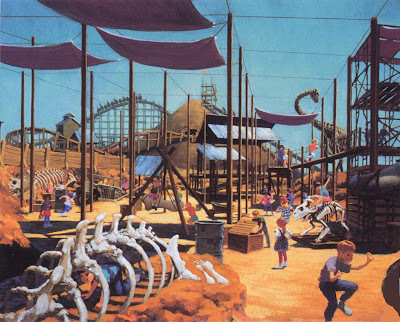 It's time to move inside Dinoland, U.S.A and this first rendering is a Joe Rhode early concept for the Boneyard. But i've found for you a rare rendering of it! 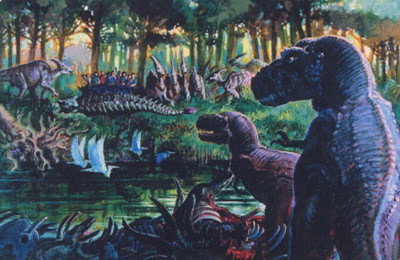 Next is an early concept by Chuck Ballew for Dino-Rama! ...and another one by Jenna Goodman. 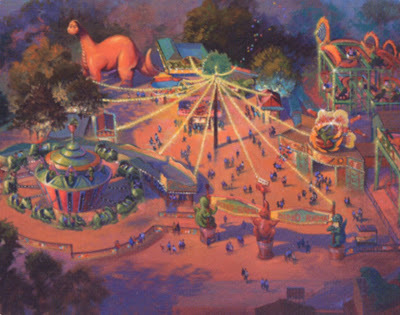 Below, a Dinoland entrance concept-art by Tom Gilleon. 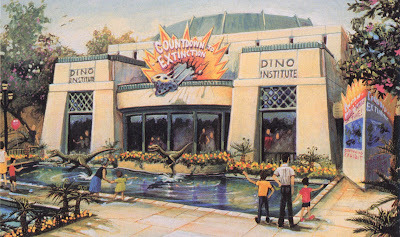 Here is a rendering showing the entrance of the "Dinosaurs" ride - formerly known as "Countdown to Extinction". 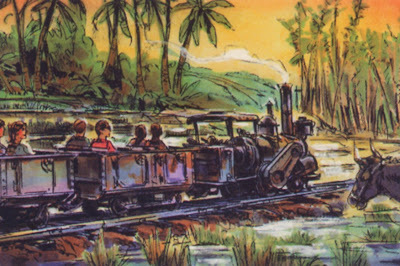 This next painting was released as a postcard at the park's opening. 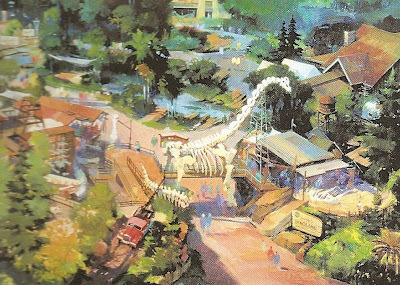 A rare rendering showing the ride vehicle and the dinosaur to be rescued. 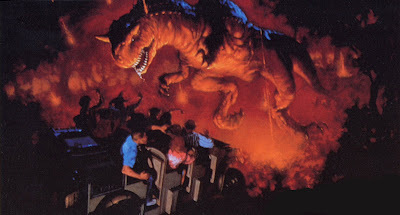 The Carnotaurus attack is the climax scene of the ride. 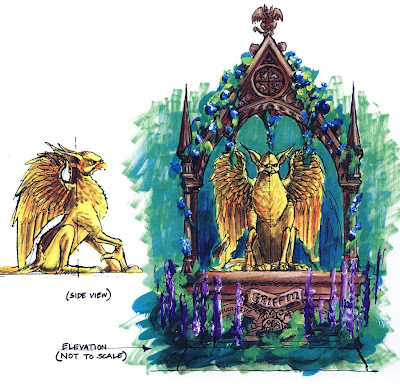 These next three renderings are particularly interesting as they are showing scenes that were NOT realised. 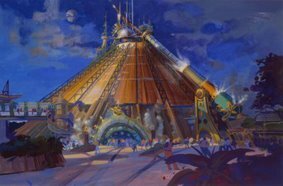 This first picture by Joe rhode seems to indicate that at one point the attraction was envisioned as a walk-through, or at least a part of the attraction. 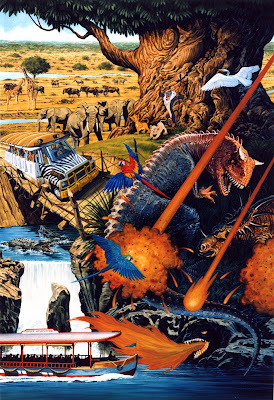 And this velociraptor attack never happened too. 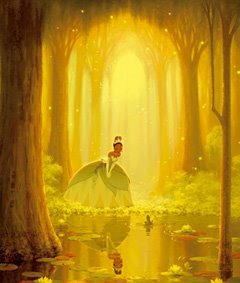 This next one shows a gorgeous scene that we can regret, and i have a story about it: In 1997 or so i was at WDI for a series of interviews and in the office of a an imagineer friend i saw this painting. I asked him if it was in relation with Animal Kingdom - not open yet at that time. 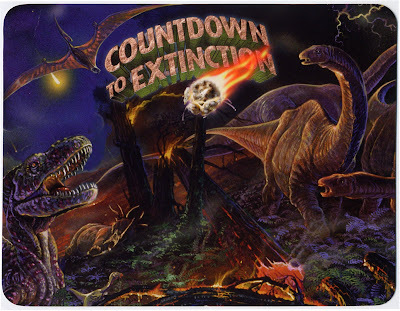 He answered me that it was indeed for the "Countdown to extinction" attraction and that "we would be lucky if it looks like that at the end...". He was unfortunately right, and this leads me to the biggest problem with "Countdown to extinction" - now "Dinosaur": the cuts in the budget. 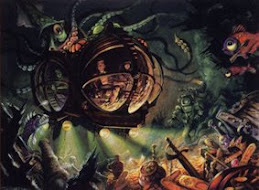 Personally, i still like the attraction, and i quite liked it the first time i've ride it, but when you see this kind of concept and know how great it could have been, you really not in the mood to thanks the suits who were Disney executives at that time. 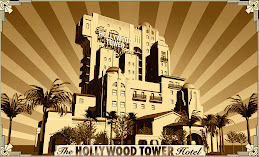 One more Michael Eisner "mistake" - and i'm kind - that we still regret today. 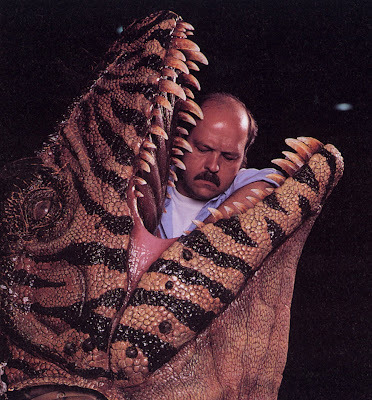 The next picture shows a WDI imagineer at work on one of the dinosaurs that we can see in the first scene - it's the one "eating" a smaller dinosaur. 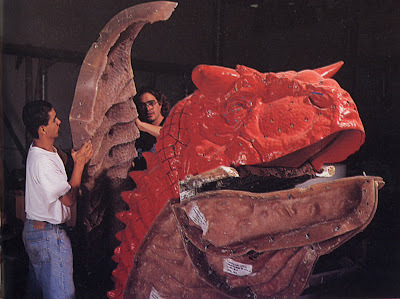 The two next one are showing imagineers at work on the Carnotaurus or programming the Audio-Animatronic. 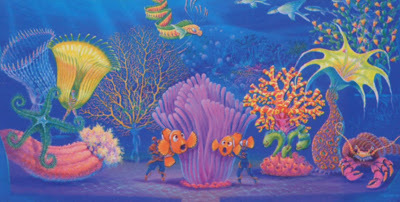 Theater in the Wild is also in the area, and the next rendering was done for "Nemo, the Musical" show. 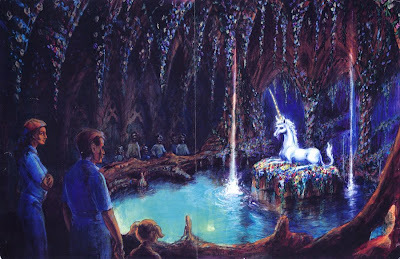 Now, there is a land that we all regret that it was never built: Beastly KIngdom. 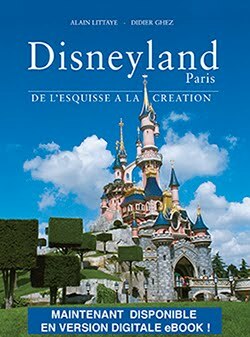 When Animal Kingdom opened, even the Beastly Kingdom land logo was at the entrance of the park and renderings of it were printed in the AK making of book. 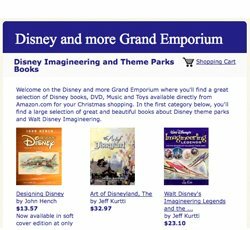 And then, we know what happened: this Beastly Kingdom project disappeared and chances to see it built one day are more than low. Thanks god, the artwork still exist, and here are some of them just to dream and see how good it could have been. First, a bird-eye view of the whole land. ..and this is one of the mythical animals - a Griffin - that guests would have encounter. 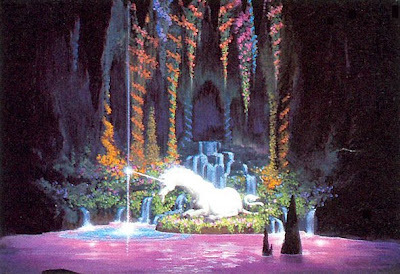 The goal would have been to find the Unicorn, in a grotto at the end of the maze. 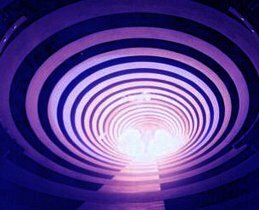 And a Fantasia flume ride wold have delight young children. 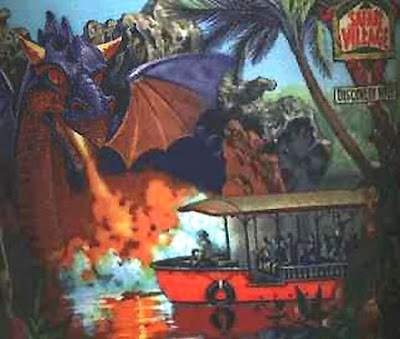 Let's not forget the dragon firing at the river cruise boats. 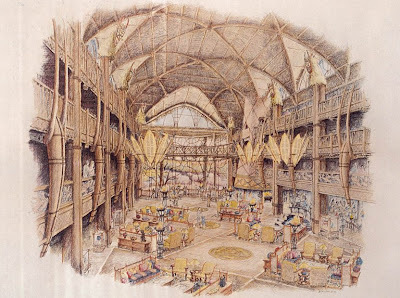 This Animal Kingdom article won't be perfect without some renderings of the Animal Kingdom Lodge. Here are two of them showing the entrance and the lobby. 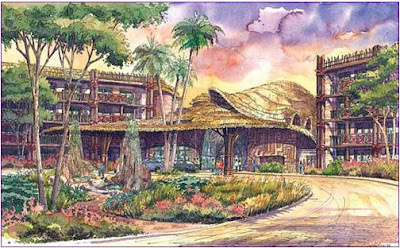 While we're here, i join two other renderings of the Disney Vacation Club Animal Kingdom Villas. 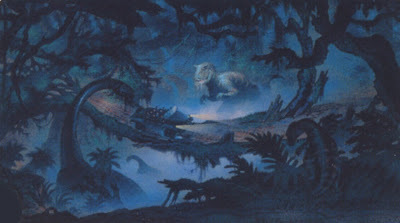 That's the end of this Animal Kingdom artwork article! 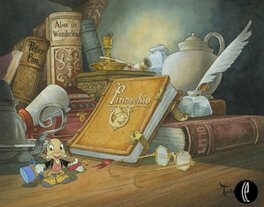 All artwork: copyright Disney - WED Enterprises. Many thanks to Mark Taft for some of the renderings. 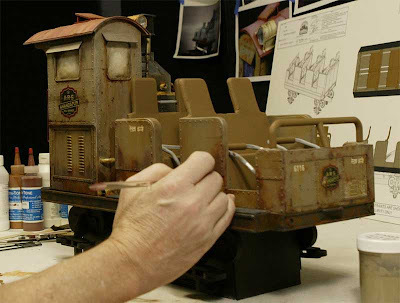 I strongly suggest you to have a look on Mark's site Insights and Sounds, it's always interesting with rare pictures or renderings and Mark is posting new articles almost every day! 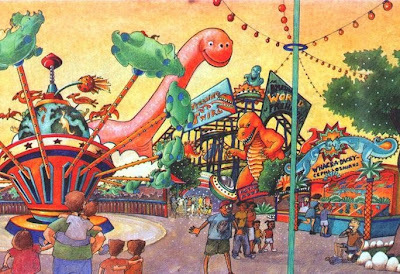 Some of the renderings are coming from the great "Imagineering Field Guide to Disney's Animal Kingdom" where you will learn all the WDI secrets in the making of the park. 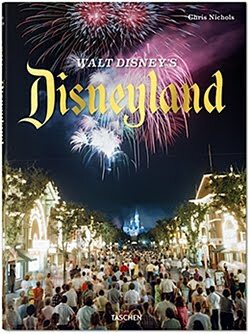 It's a "must" and you can find it on Amazon.com from only $3.87! 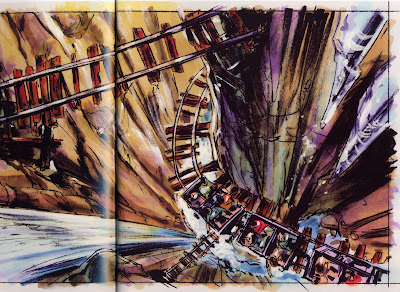 Some other pictures are coming from Jason Surrell's fantastic book "The Disney Mountains", full of WDI artwork. 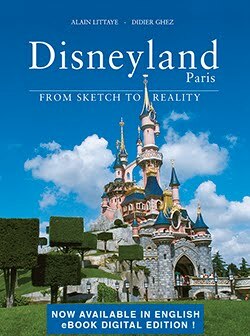 You can find it on Amazon.com from only $8.90 and it's also a "must"! 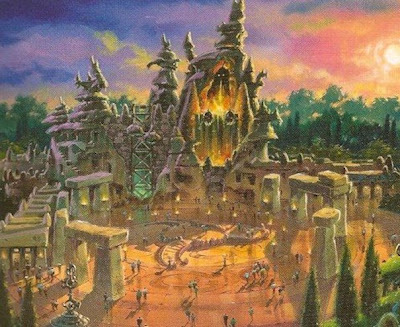 Wow, so good to finally see a rendering of the dragon's castle! What was supposed to be inside? 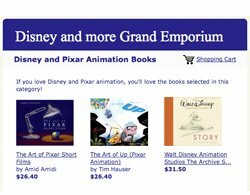 Thank you for sharing this disney update roundup. Alain, thanks for the concept credit! 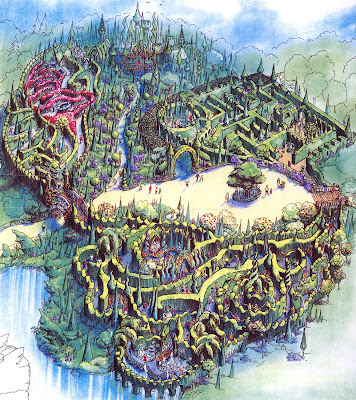 I think we keep sharing the renderings we find- which is wonderful! Love the update. 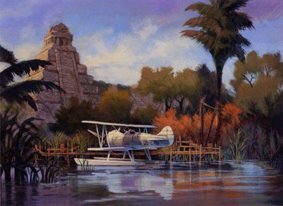 Part 3 of my DAK Series: A True Life Adventure is on its way soon! Awesome stuff! Thanks for posting! 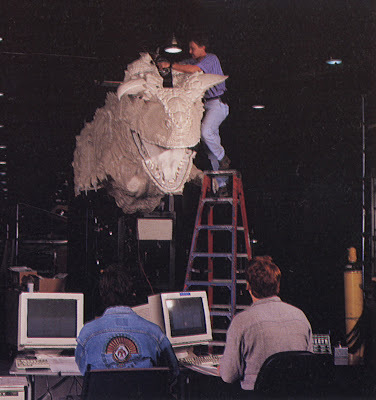 My problem with CTX has always been the lack of the "big room" like in Indy, where you could see dinos all over...to give it an epic feeling. I know the track layout is the same but so much is dim or dark it doesn't give the same feeling. 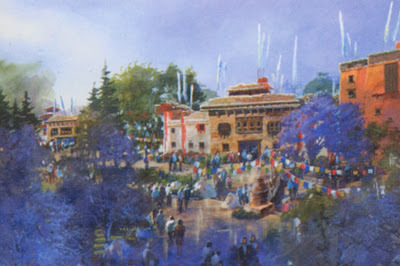 Does anybody know from when those Expedition Everest renderings are? 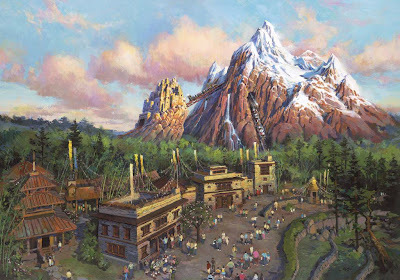 I would really like to know if Expedition Everest was to be part of the park right from the beginning. 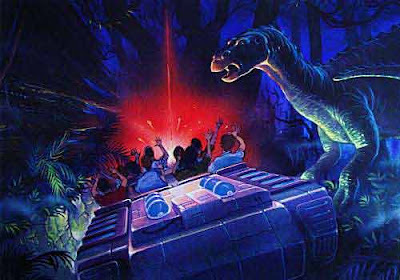 The early concept for the Dinosaur thrill ride was that the vehicles would be Anklyosaurus (the armored dinos) (there is concept art somewhere on the web for these). 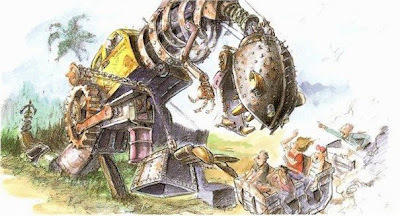 The pic that Alain says might be a walking tour is actually the Anklyosaurus vehicle. 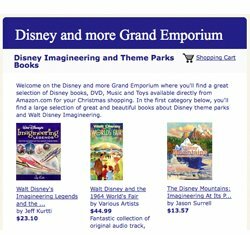 According to the Disney Mountains book, Everest was not part of the original plan for the park. They new they needed an E ticket to help attendance. 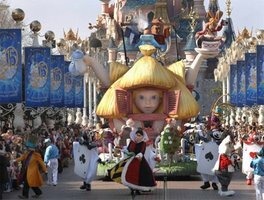 Beastly Kingdomme and Dragon Tower were considered, but it didn't make economic sense to tear down the extremely popular lion king show in order to build it. So they looked to Asia and came up with an Himalayas/Yeti idea. Thanks Alain and Mark for the great artwork. I think some of those Beastly Kingdomme images came from Issue 12 of Tales from the Laughing Place magazine (and I think the Dragon Tower one was an exclusive to them). 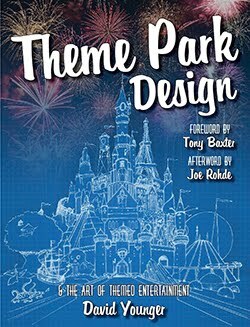 If you love DAK and haven't got that issue I would strongly recommend it - it is a fascinating interview with Joe Rohde with pages of artwork. 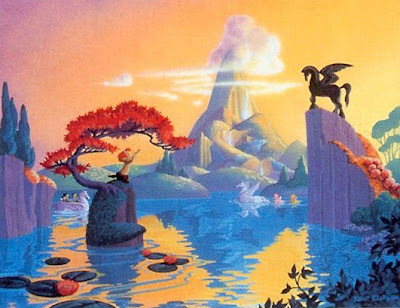 The Chuck Ballew Dio Rama illustration is actually a Phillip Freer painting. Both at Disney at the same time. These are fantastic concepts. 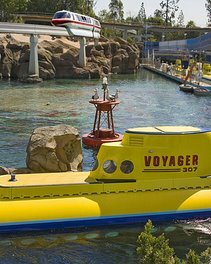 The Imagineers were truly at the height of their game. 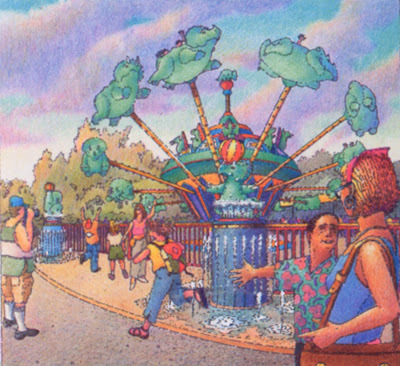 The Carosel of the Animals was truly unique and could be still built as one enters Discovery Island. 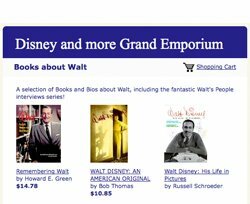 Too bad Eisner was too shortsided making the cuts that he did. 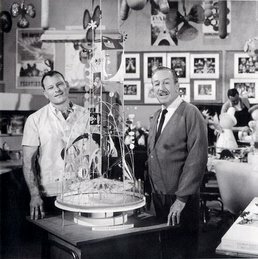 Everett was a need addition, but more of the Imagineers vision needs to be realized. 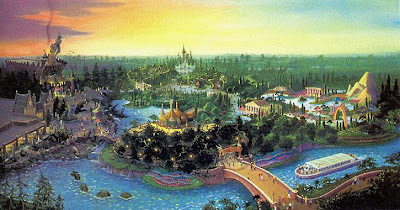 To compete against Harry Potter, the Beastly Kingdomm and the completion of the Tiger River Rapids Safris would secure it hands down for Disney. 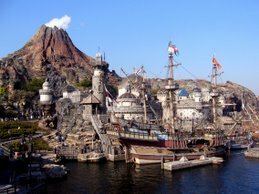 Throw in new attractions based up Tarzan and the Jungle Book, Mysterious Island (Journy & Voyage) and you will have an unbelievable park. 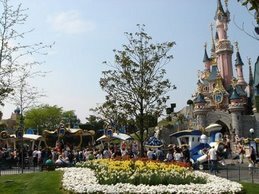 Add in a hotel within the park and you have the US equivalent of Disney Sea. Now, you have a park where one spends the entire day. 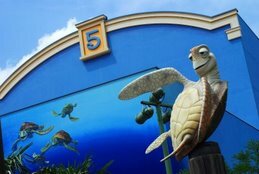 The Conservation Center could be beefed up with a Wonders of Life attraction. The ideas for this park are unlimited. 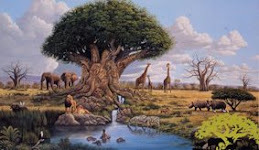 However, Disney needs to go back to the original vision - animals that are, animals that are extinct and mythical animals. 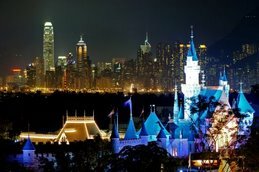 This would truly be a unique Disney Park. 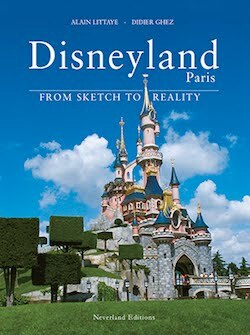 One that will draw many to WDW. 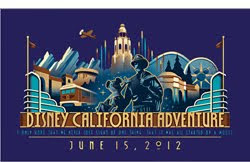 Imagineers, my hat is off to you. 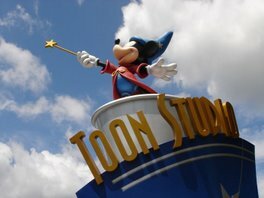 You are the heart of Disney and have his spirit, not the suits. 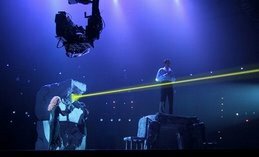 WALL-E won Best Animated Film Academy Award !